Software Defined Networking (SDN) and Network Functions Virtualisation (NFV) are set to change the networking industry and, as part of that change, virtual Customer Premises Equipment (CPE) is an upcoming technology paradigm that promises to be beneficial for both customers and service providers. Sytel Reply is the Reply Group Company specialising in an open and pioneering consultancy approach that helps clients successfully innovate and transform in today’s ever-changing digital world. With a ‘Give to Get’ mentality, Sytel Reply UK enables clients to grow through the development and delivery of secure, compliant and future-proofed solutions for some of the largest telco and media enterprises worldwide. By bridging the gap between technology and business, Sytel Reply UK focuses on increasing revenue streams and efficiency, whilst reducing costs and time to market. Today, residential and enterprise environments are evolving rapidly due to an increasing number of devices that will be part of our lives in the near future. Upcoming technologies like Internet of Things (IoT) are going to have a huge impact on today’s network deployments. Furthermore, the upcoming intelligent devices introduce the need of new services, in order to meet the customer’s requirements and efficiently support both new and existing devices. The traditional CPE cannot easily adapt and is not flexible enough to host the rapid introduction of new services. Instead, the equipment is getting more and more complex and harder to maintain. This is due to the complexity of manual configuration for each additional hardware device or for maintenance and re-configuration of the CPE. Virtual CPE on the other hand, is a very promising scenario that brings new benefits and opportunities on board, like Operational Expenditure (OpEx) and Capital Expenditure (CapEx) reduction and improved Time to Market (TTM) through faster introduction of new services. Traditional CPE. Today, most customers have devices such as smartphones, laptops, desktop PCs or even Smart TVs connected to the internet through their CSP (Communication Service Provider) of choice. The amount of devices that need to be connected to the internet is increasing continuously. CPE is the demarcation point, which connects the customer network site​​ to the Service Provider’s Network. According to the CPE architecture, in the customer network site several peripheral hardware devices need to be deployed, where services are being implemented. An example of this architecture can be seen in the figure below: "Traditional CPE Architecture". 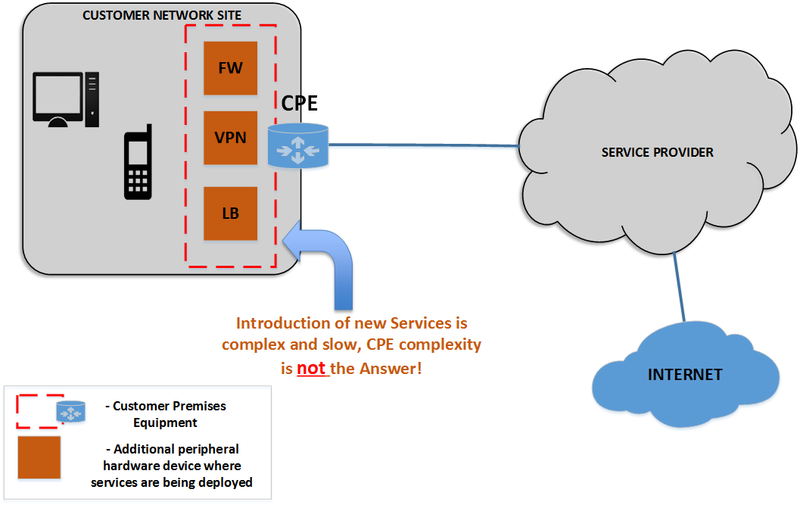 The CPE is already complex and the introduction of new services usually requires either the installation of additional peripheral devices, in order to deploy those services (e.g. firewall, load balancer, VPN etc. ), or even to replace the existing CPE. Obviously, CPE complexity is not the answer, because the introduction of new services is complex and slow. Virtual CPE paradigm provides dynamic services on demand and introduces new service models such as click-and-play, try-and-buy, pay-as-you-go etc. This enables a better user experience, through value added services such as parental control, customer network appliance management, WAN optimisation and security enhancement. With vCPE, deploying a new service or even turning down a service is not a great eff​ort anymore. vCPE Potential Approaches. There are 3 potential solutions in the vCPE use case. 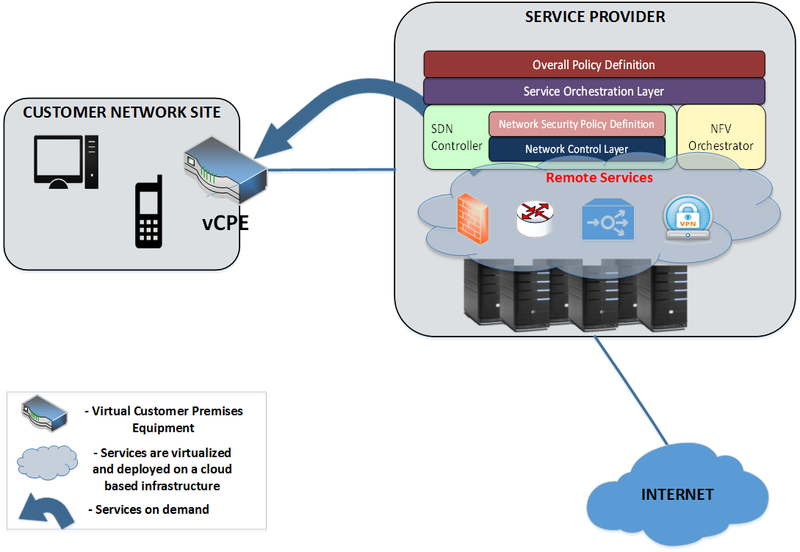 The first one is to virtualise all CPE functions into the CSP network site as it is depicted by the figure above. 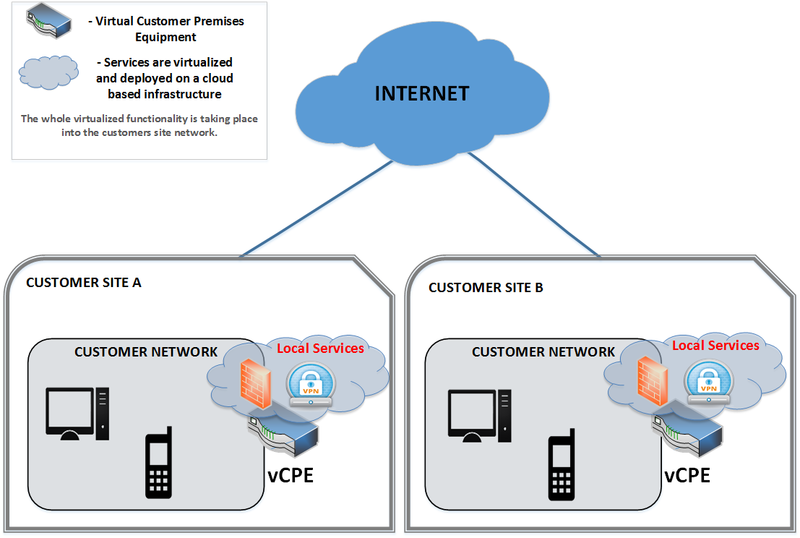 The other two solutions are, first to have distributed virtualisation of services between the customer network site and the CSP network site, and second, to have all the functions virtualised locally without any data centre involved, as depicted in the figures below: "vCPE - Virtualised functions are distributed between the customer and the service provider site"
and "vCPE - All functions are virtualised locally at the customer site". The best solution is to have the services virtualised where it is most appropriate according to the organisation’s needs, which may be based on performance, feasibility, security, policies, financial aspects, etc. Based on the evolution of CPE and the adoption of vCPE a number of benefits and opportunities can be realised both by enterprises and service providers. The following list provides some examples. The vCPE paradigm is very promising and aims to make both customer and CSP life easier. Current CPE deployments are getting more and more complex, and are no longer able to provide efficient and effective ways to deploy both new and existing services that will satisfy and meet customer’s needs in the near future. This is where the concept of vCPE comes in with a solution to the problem and brings to the surface new opportunities for business and revenue.